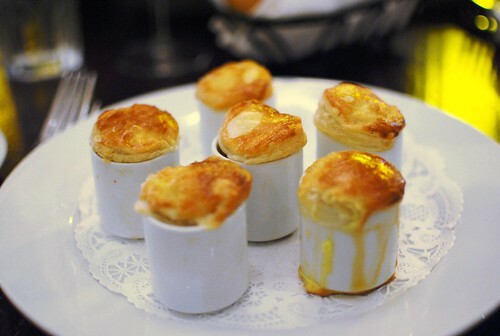 I’ve been hearing a lot of positive things about Le Saint Amour, a French bistro in Culver City. What really got this restaurant on my radar was that Walter Manzke (whom I am a huge fan of) was brought on as a consulting chef late last year. Granted, the involvement of a “consulting chef” varies widely (couldn’t any restaurant on “Kitchen Nightmares” boast Gordon Ramsay as a consulting chef? ), but my interest was piqued. A BlackboardEats 30% off deal was exactly the tipping point I needed to come in. 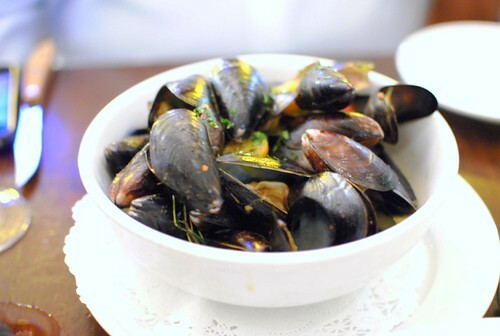 The menu is classic French – think charcuterie, escargot and moules/steak frites. Our party of four decided on four appetizers and five entrees. 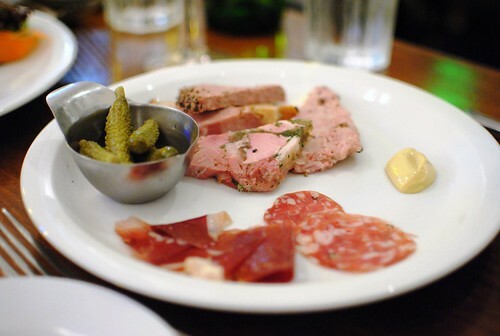 I don’t appreciate charcuterie as much as I’d like…I’d almost always prefer a cooked slab of meat. However, of all of the meats on this plate (most of which I don’t recall), I enjoyed the duck prosciutto the most (bottom left). A great example of the classic dish here. Strong garlic, parsley and butter flavors complemented the tender and chewy snails. The puff pastry was done well too, flaky and served hot. 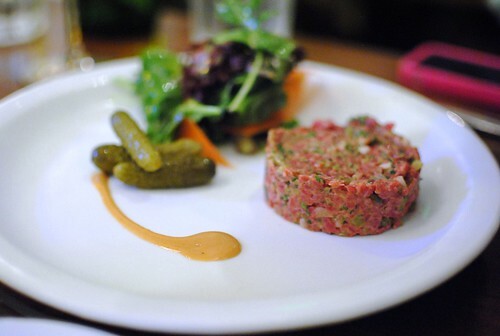 I liked the presentation of the tartare, particularly the uniformity of the chop and the colors. Unfortunately, it didn’t taste as good as it looked; there was something in here that was overly acidic and tart, overshadowing the beefy flavor. I did like the textures in the tartare, but that wasn’t enough to save it. Probably the best of the appetizers we ordered. 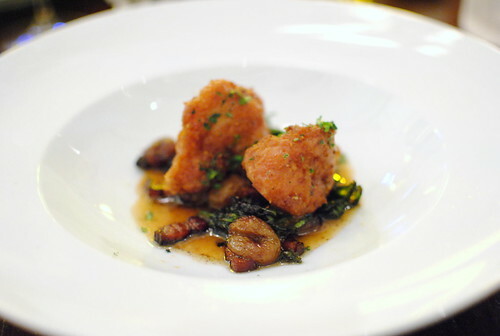 The breading was light and crispy, while the sweetbreads was moist. I thought the mustard greens added some body, while the roasted grapes contributed welcome sweet and fruity accents to the dish. 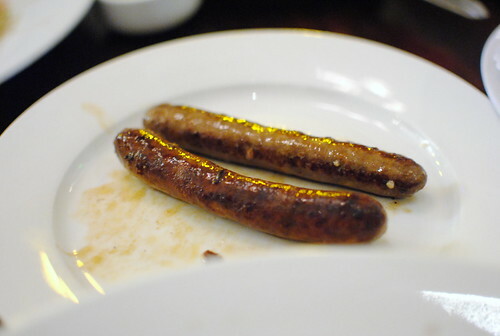 Advertised as three different sausages and explained as such when it came to our table, we were surprised to find that we actually got only two variations – one boudin noir and two of the Toulouse. Only once we inquired were we told that they were out of the third sausage. I thought this was a bit dishonest of the restaurant, feeling as thought they tried to slip one past us. We were supplemented by some merguez sausage, which may have been the best of the bunch. I’m just glad we didn’t get extra boudin noir. 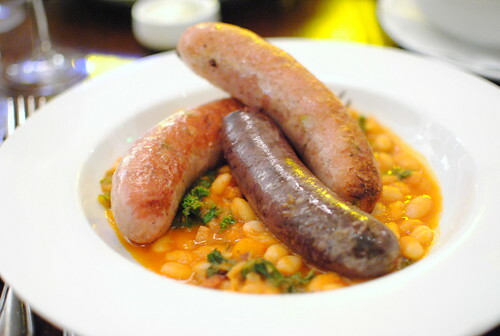 It was undercooked, leaving a chewy and difficult-to-eat casing, as well as a pudding-like sausage that bled out of the casing when cut (pun intended!). Adding to our entree drama, we were informed their fryer broke – french fries were no longer available. Sounded like this had been a frequent occurence lately, given one person at our table had the same thing happen less than a week prior. I think the fries are an integral part of steak frites or moules frites, so I wasn’t too enthused to hear the options were a salad or sauteed vegetables. After some back-and-forth, we got a substitute side of kale with bacon, shallots and lemon. 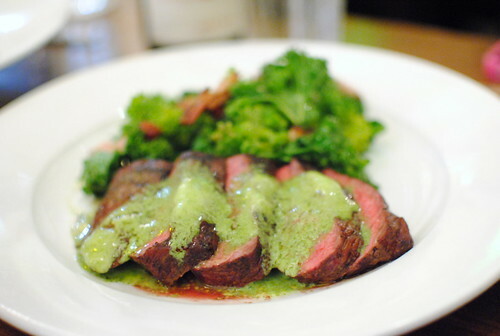 The steak was tougher than I expected but had good flavor and was cooked well. Expectanctly, the butter added a welcome richness and some herbal depth of flavor. The kale was quite good too, with the lemon and bacon being key flavor profiles. I was expecting a portion of a traditional whole-roasted chicken, but this variation was a half-chicken pounded thin and pan-roasted. This allowed for a very crispy skin while the meat was delicious. The ratatouille provided some bright flavors that I thought paired pretty well with the chicken. 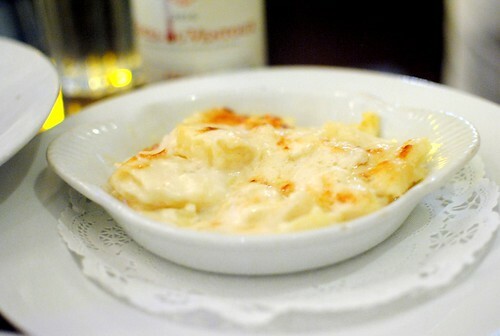 Our substituted side for the mussels was potatoes au gratin. I found the mussels to be tiny, but the broth was excellent. 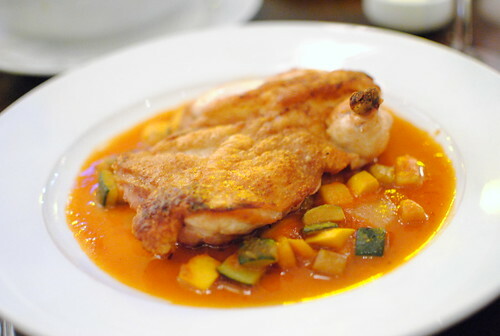 It really benefited from the saffron, which added a subtle aromatic characteristic to the broth. The potatoes were solid, but I was really missing some crispy fries to dip into the broth. 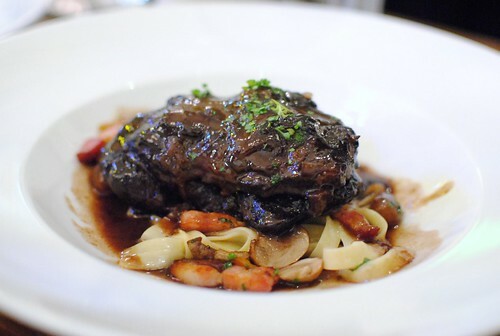 Tender chunks of beef cheek were smothered in the rich braising liquid. Very flavorful and very good. The butter noodles (finally, an appropriate starch) were good as well, sopping up the rest of the sauce. We ordered quite a bit of food, so we opted to split just one dessert. 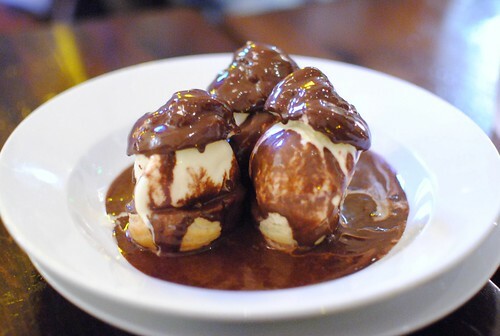 Pretty good profiteroles here. Kept simple, I thought the ice cream and chocolate sauce were both solid, while the choux pastry was light. Always love the hot-cold and vanilla-chocolate tandems. Overall, my experience at Le Saint Amour was disappointing. Maybe my expectations were too high, but quite frankly, I’m glad we didn’t pay full price. There were clearly some highlights to the meal, offset by some lows too (boudin noir, steak tartare). Plus, the sausage and french fry issues really detracted a lot from the food. I’ve been told I need to try their brunch out, but I’m not in a hurry to do that. aww….yah, they could have upped their game. 30% off was a great way to test the waters. Hmmm, it seems like maybe the meal overall was kinda solid (and the photos are beautiful), but not for the price? We’ll put this one on the maybe-with-a-deal list. Yeah that sums it up pretty good. There’s a lot of other options in Culver to try too. Boo to those weird issues! Yeah hopefully they get that fryer back on track at some point. I heard the fries were great..